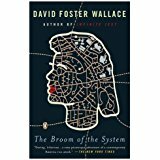 In its own right, especially as a first novel by then 24-year-old MFA student David Foster Wallace, The Broom of the System is a clever and entertaining if quirky and meandering read. An arguably excessive (467-page) tale of an underachieving Cleveland telephone operator struggling to make sense of her 20-something life – populated with a cast of peculiar relatives, suitors, and friends – Broom neither disappointed nor swept me away (pun intended). Now, full disclosure: I set the bar fairly high here for Mr. Wallace, who committed suicide at 46 after being hailed by many as the latest great American novelist. I will admit to having surrendered in some agony less than halfway through his so-called masterpiece, Infinite Jest, when I realized, as with so much modern art, the “jest” was on me for having spent irretrievable time and money on this obscenely excessive, madly footnoted (1,087-page) literary bewilderment. After Jest, I was ready to give up on Wallace altogether, until I watched “The End of the Tour.” This highly engaging 2015 film about a Rolling Stones reporter (played by Jesse Eisenberg) who interviews the celebrity writer (played by Jason Segal) for several days during a book tour following the publication of Jest made me wonder if I had jumped off the DFW appreciation bus too early. So, I decided to go back to the beginning and give Wallace a second chance. While Broom, unlike Jest, does have a recognizable plot and thankfully no footnotes, plus it is original and very funny at times, I was distracted by its numerous sub-plots, oddly drawn and named characters, and Wallace’s need to impress us with his ample creative abilities. One such ploy I found particularly annoying was his abundant use of the ellipsis between dialogue exchanges, as if to suggest one speaker has paused and is presumably giving the other speaker a thoughtful or curious expression. Cute at first, but alright, we get it. I’ll let you make up your own mind and curious expression. My advice: definitely rent “The End of the Tour,” consider reading Broom, and should you find yourself helplessly snowbound in a remote log cabin with absolutely nothing to do, or happen to be one of those people who appreciates a large white canvas with a blue dot in the middle, Infinite Jest may be for you. As for me, David Foster Wallace is unlikely to get a third shot. Fine observations articulated with literary acumen and cogency. “The End of the Tour,” in my mind, is the beginning of the tour in getting to know basic aspects about David Wallace, before delving deeper into his literary art. Knowing and hearing his actual sounding voice and cadence is helpful when reading the printed words. There is no better introduction to him that I know of than the moving picture production mentioned above. His book Infinite Jest is titled from a line in Shakespeare for a reason and I think you, Mr. Wolcott, have nailed Wallace’s difficulty or the ‘demand that he places on the reader’ when you relate the required strain to absorb his massively jestful work in toto. It’s a lot of marijuana combusted to reach his elevation and perspective, I think, and as a partaker himself, Shakespeare might not have been able to hang long enough with Wallace himself due to the potency of the strains today. That is to say, David Wallace is best read in the state in which he wrote. Fortunately not enough snow here in Seattle to justify time with Wallace. I thoroughly enjoyed your review; it reads like an entry from the New York Times or The New Yorker. Keep up the good work. You have created a blog that’s always informative and fun to read.